Do your wallet a favor: make iced caramel lattes at home. It’s easy and with this recipe, it’s so quick! Fresh homemade iced caramel lattes, coming right up. These are perfect and refreshing, and the recipe I’m sharing today is a complete breeze. You no longer have to drive and wait in line for 10 minutes to get your favorite drink. This iced caramel recipe will save you time, and it’s easy on the wallet – less than $1 per serving depending on the brewing method. What I love about this recipe the most is that you don’t have to do ANYTHING in advance. You don’t have to make cold brew concentrate or wait for the coffee to cool. This is the easiest method: make double strong coffee, pour the coffee really slowly over ice while it’s still hot, stir in caramel sauce and splash in some milk. Step 1. Prepare 4 oz coffee and make it double strong. If using ground coffee, use 2 tbsp ground coffee + 4 oz water for every serving. That’s 4 tbsp coffee + 8 oz water for two servings or 6 tbsp coffee + 12 oz water for three. If you have a Keurig, brew 1 dark roasted k-cup at 4 ounce cup setting. You can also use a French press. Step 2. Put 4 large ice cubes in a glass and then slowly!! pour coffee over ice cubes. You don’t have to wait for coffee to cool, do this slowly and the ice will cool the coffee down and dilute it to its ideal strength. Plus, it will lock all the flavors, which results in fresh, sweet iced coffee. Step 3. Add 2 tbsp caramel sauce or dulce de leche (yum! ), and 4 ounces cold milk and stir well. Step 4. Top with whipped cream and drizzle with a generous amount of caramel sauce. 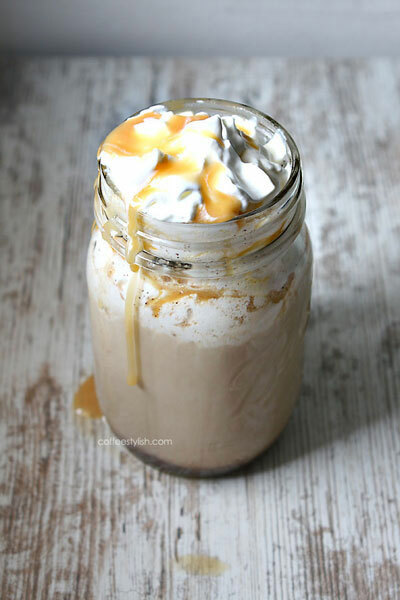 If you can’t get enough of caramel you should try some of my other favorite caramel recipes like Caramel Macchiato, Salted Caramel Mocha or this delicious Dulce de Leche Iced Coffee Float. SO freaking good.